My word, our heroine has done it again. A whole year has gone by and it’s suddenly NaNo Eve! I planned all along to do NaNoWriMo. I do it every year – it’s a given I’ll participate. I have my spreadsheet ready for tracking my progress and a general outline of what I want to write. I’m neither pantser (anymore) nor planner, but rather a hybrid. I feel both approaches have merit, especially when it comes to NaNo. If you read this blog when I regularly updated it, you’ll already be aware of my NaNo Curse. It gets me every year. Something unexpected comes along and I have to navigate my way around or through it in order to survive and win NaNo. Sometimes, like in 2016, it just doesn’t work out for me. (That was the year both my son and I were in the hospital for a while.) I’m anxious as I write this, wondering what form the NaNo Curse will take this year. Will I get past it? Tune in and fine out, dear Reader. My personal goal every year is to meet the point I want to reach before Thanksgiving. This year, Thanksgiving is rather early, the 22nd. It’s going to be a challenge considering I’m out of the habit of writing daily. My hope is that this year’s NaNo puts me in BICHOK mode daily once again. I miss writing with all of you. So lots of anxiety and hopes wrapped up in my approach to NaNoWriMo 2018. I’m as ready as I’m going to be, barring picking up some creature comfort supplies today. How about you? Are you ready? NaNo is all about challenging one’s self, so bring it on! Our heroine is plagued by an annual NaNo Curse, dear Reader. Everything from pneumonia to chronic migraine has hit me in November, making me work all the harder to reach my goal for NaNoWriMo. Despite the Curse, I have always hit the goal line, sometimes by the skin of my teeth. The Curse started early and stayed late this year. I cleared several hurdles, but the biggest obstacle came in the form of extended ER visits and hospital stays. Since I’ve been home, I enjoyed an ambulance ride, had to go back inpatient briefly, and am giving myself IV antibiotics at home. A barrage of home nurses visiting and the expected journeys to doctors’ offices take up much time. It leaves little time for writing. I talk and post about “The Spirit of NaNo” every year. I tell wrimos they’re winners because they write what they can when they can as they navigate the obstacle course of their busy lives. I believe it to my toes. This year, I embrace it on a personal level. For the first time in years, I got nowhere near the 50k. Sure, I could have cheated and got my 50k of nonsense validated. That isn’t why I participate in NaNo, though. I do it to enjoy the balls-to-the-wall writing experience. I may not have had a lot of that energy writing this year, but I dove in when I could. That’s the Spirit of NaNo. My NaNo novel died, but I survived. 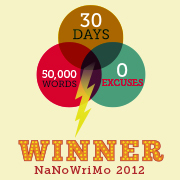 I feel like a winner because I held onto the philosophy behind NaNoWriMo. That’s the basis of any goal I set going into NaNo each year. It’s November 10th. We’re now in the thick of NaNoWriMo. Many shook their heads and threw up their hands during that first week. I can’t blame them. NaNo is a big challenge. The first few years I peered down that trail toward the goal line, it was so far away, it was nearly invisible in the distance. I miserably gave up within days the first two years and just plain skipped it the third. It was so bad, I don’t even remember the years – I repressed the whole thing. Doesn’t sound like much of a pep talk, does it? Here’s the pep part: I won the first time in 2008 when I finally tried again. I won a week early! I almost put away my keyboard five days into it, though. I was sick and miserable. The last thing I wanted to do was write a million words each day. A good friend refused to let me give up. “Just write something today. I don’t care if it’s 300 words. Write something.” So I did. Then I crawled back into bed with my cold medicine and my teddy bear. When I woke up, I hazily did it again. A few days later, I was healthy. I was behind, sure, but I kept writing. With a little extra each day, I could catch up. Need more pep? All right, you asked for it: my NaNo Soapbox. Ladies and Gentlemen, behold the Spirit of NaNo! Look beyond the fifty thousand word goal. It is not that shininess. No indeed, it is within you already. You have only to let it free and let it flow. Does that sound ridiculous? Stay with me a minute. It’s the Power of Writing, my friends. Just feel The Power of Writing, let it flow through you, let it catch up your imagination and run out your hands without the demon of the Inner Editor making you second guess it! That is indeed the Spirit of NaNo. Grab that and you’ll JUST WRITE. Here’s the secret: write every day, make a habit of it and you’ve won the real shiny prize. If you commit to writing when you can, writing around your obstacles toward a goal you set for yourself – that’s how you embrace the Spirit of NaNo! Stick with it, everyone, and may you all win the Real Shiny Prize. Whether prepping for or deep in the depths of NaNoWriMo, we tend to focus on word counts and stifling the inner editor. Don’t get me wrong. These are important issues. The latter helps with the former and the former is what gets you beyond that official finish line. Let’s talk about what you can do to improve your experience. These are techniques which have little to do with plotting and wrangling words. These are meant to rejuvenate your energy stores, to lift your spirit, and to freshen your sense of purpose. They make it so much easier to do the stifling and the writing. Simply put, I’d like you to consider what you can do for your comfort and pleasure. Self-care is greatly overlooked, especially during NaNo. We wrimos tend to develop tunnel vision and I’m telling you, it’s easy to feel the walls crowding you when you’re in a tunnel. What do you do when you’d like to treat yourself? Not a spa weekend, but rather a small pick-me-up. How do you like your environment so that you’re not distracted by it? If I didn’t make lists for these situations, I’d get lost in the tunnel vision. I make two lists: Get and Do. I enlist my kids in helping me so the Getting and Doing don’t become chores themselves. Asking those close to you to help prepare you for and refresh you during NaNo also reinforces how important it is to you. One stone, two birds there. I’m wary of stereotyping genderwise, so my disclaimer is these are examples which work for me. YMMV. I hope some of them inspire you to finding your own way out of the tunnel vision. When you make your list, keep in mind the little incidentals. Will you need change for laundry machines? Getting quarters means one big step I can skip at laundry time. What helps you cleanse your writing palate? Maybe cooking a special meal or going for a run? Just as important, you can list items just for fun, ones which aren’t really options. When you feel a little frantic about writing, your writing gets bogged down. Lighten the mood and your outlook by looking at your list and picking something you enjoy. Taking a little time away from writing may be just what you need to get your head back in the game. What is on your list? Please share and inspire other wrimos at the same time. #NaNoWriMo: Stop with the Waffling! This originally appeared on the #amwriting site a couple years ago, but bears repeating. You – yes, you – can still be caught up in the excitement that is NaNo. Have you been compiling pro and con lists? Perhaps you think you just don’t have time for it. Maybe the idea of writing that much in one month is too daunting to contemplate. Are you in the midst of a work-in-progress and simply don’t wish to step away from it to start something new? Do you sigh and wistfully say you just can’t do it? There are so many reasons people state to explain why they don’t want to do NaNo. Don’t get me wrong: I respect another’s choice in the matter. A simple “I don’t want to do it” makes me nod and back off. NaNo’s not for everyone. It is, however, for many people who think it can’t work for them. The spirits of encouragement and camaraderie during NaNo are not to be underestimated. Put those on your pro list and underline them for emphasis. Whether you’re in it to be utterly nuts and compile a novel full of “plot bunnies” and challenges (see nanowrimo.org Forums for more info) or you’re working on a more conventionally legitimate project, you’ll find people ready to support you and keep you going. The NaNo Rebels group is going strong again this year. Check out this link about NaNo Rebels on the nanowrimo.org site for official info about the Rebels. If you’re in the middle of a WIP and don’t want to set it aside, write nonfiction, or write in formats other than novel-sized ones, you can participate by being a NaNo Rebel. The goal is the same: 50k new words on your project(s). Consider setting a different goal for yourself. No one says you have to write 50k words. No, you won’t “officially win” NaNo by writing 20k words. You may write your heart out during the hours you have available, though. You may be pushing yourself in ways you never have in order to reach the goal you set for yourself. That’s NaNo, baby! The whole point of NaNoWriMo is to push yourself and just write. Gag and tie up that inner editor who makes you go over everything you write as you write it. Just. Write. No matter what, it’s a great exercise for anyone who gets into ruts because of that inner editor. If you need to set a different goal for word count, no matter. The exercise and purpose for it are the same. I have done NaNoWriMo for several years. It’s a huge reason I began writing after a 15-year hiatus. On the NaNo site as JC_Rosen (isn’t that clever? ), I’m open to buddy listing. 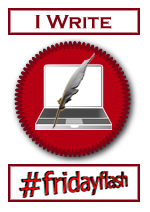 I usually use the #NaNo hashtag in addition to #amwriting during November. Join us! We do sprints. Progress measurement is up to you.